Sadly, Richie Hawtin’s copy of Traktor doesn’t talk to you directly. “We’re about to go on. I’ve got my files cued up.” “Oh, Richie’s hands are sweaty today. Ugh.” “Hey, who’s that hottie who just got onstage?” “I hope he uses all four of my decks.” “I’m sorry, Dave, I’m afraid I can’t do that. lolz” Photo (CC) Caesar Sebastian. For everyone who thought Twitter was just about “i m eating a ham sandwich lolz,” the desire to use connectivity to actually be connected continues to win out in unexpected ways. 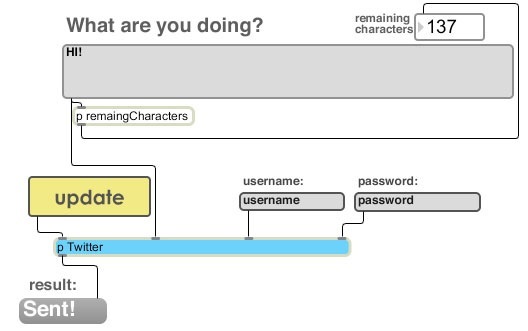 So far this month, we already saw the use of Max/MSP. 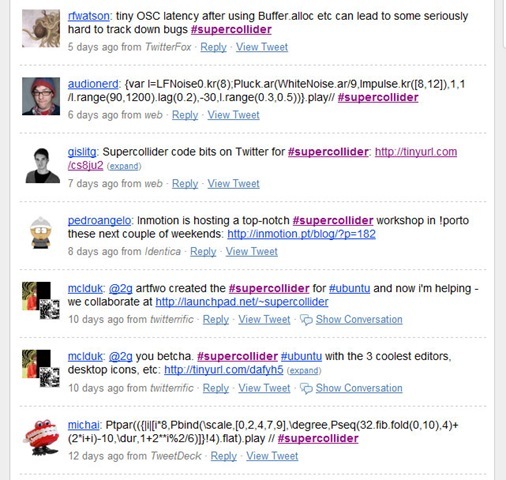 Now, Twitter is showing up in the geeky, open source sound tool SuperCollider and in DJ sets in Traktor by Richie Hawtin. First, some updates on Tweet a Sound, the sound design tool in Max that lets you share synth presets. This means, if you’ve got a Mac or Windows copy of Max/MSP, you can now send Tweets from your patches. And that should open up still more possibilities when Max for Live becomes available, for Ableton fans. Even if you’re skeptical about Twitter per se, if you’re interested in using Ruby and Max, this should be a good starting place for other APIs, too. Friends of mine like Francis Preve have gone utterly nuts for this. SuperCollider is an elegant, free, cross-platform synthesis language that expresses sound and sequencers as code. 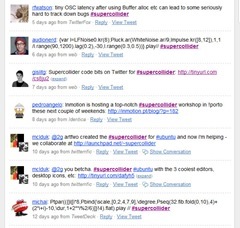 Since, unlike Max, its language is text, no conversion is necessary: savvy SuperCollider sonic programmers are simply copying and pasting code directly into Twitter. It’s an interesting exercise. As people have done with Processing for Twitter-coded graphics, the tiny 140-character limit means the challenge of trying to do more with less. You’ll also see in the search, in addition to code there are lots of casual exchanges of tips and advice. I’m not sure anything can cure me of my own sprawling code, but there’s something soothing about everyone else’s little code snippets appear. What this doesn’t mean: no, Richie Hawtin is not tapping away on a cell phone while he plays, and if we see any of you Twittering onstage, we will call in the Dead Acts police. What it does mean: you can keep track of track listings by tuning in on Richie’s Twitter feed. Updates happen every 30 seconds. Now, generally, the mention of the words “Richie” and “Hawtin” seem to trigger some sort of irrational torrent of Internet hate in comments, so I’m hoping that doesn’t happen here. Personally, I think there’s some interesting potential to all of this – imagine if people who heard your live set could then go check out album versions of your songs the next day, and discover that some of you really are doing live PA stuff and not just straight DJing, too. Also, Minus promises they’ll release the software to other Traktor users in the near future. It’s something of a contrast with the Max users who may actually broadcast the patches and presets they’re using while playing, but that’s what makes all of this so intriguing. I agree with many of the points here on some level, but author Christen Reutens at Beatportal seems to be getting a little carried away. Online radio playlists were also supposed to change “everything” – and then didn’t. For one thing, the ability to purchase played tracks, while something that still has potential, hasn’t yet taken off in a big way. For another, legal questions have come into play. In the case of radio stations, publishing playlists in the US can make a radio station into a “jukebox” and become subject to greater licensing fees. I’m not sure what licensing considerations the DJ playlist could prompt – in the best case scenario, it could mean payments for artists; in the worst case, it might turn venues off from allowing DJs to publish playlists. Also, as far as mystique, this is an entirely opt-in service. And many of the changes Christen describes have already happened because of digital files and Internet communication – with or without Twitter playlists. Of course, feel free to disagree. ’s likely to be used primarily by really big fans of certain DJs. The problem with Twitter is, that information could get stuck on Twitter. Smart DJs will use RSS to pull the information into their blog and give some of that context back. And as for DJs who have hidden behind producers’ tracks while creating a false sense of mystique – well, uh, some of us who are greater fans of live PA won’t be shedding any tears. Those who are intelligently warping tracks so they’re barely recognizable, requiring a Twitter feed to follow what’s going on, we salute you. I’m not sure I’d want to be glued to a Twitter feed while in a club, with all the other Tweets happening, but it’s interesting. Perhaps more interesting than the features for fans is that Hawtin and company propose to get producers paid some royalties when their tracks get played, by using this feature for more accurate tracking – see James Holden on comments here. And there’s nothing stopping the smart-a** music enthusiasts from going to sets without this feature, tapping away on their cell phone to prove they actually know what they’re hearing. We might even follow you. This is all very interesting, but I have to wonder if we should all take the next step and start thinking about open ways of connecting software. Of course, it makes sense to use Twitter for quick snippets and Twitter-style communication, because people are there. (Not to mention, I like the idea of freaking out your Twitter followers with unreadable code gibberish.) Likewise, it makes sense for software makers to do some of their own online integration, as Ableton has done with Share – a feature we’ll be examining in more depth. But Twitter itself, while an interesting novelty, is not ideal, because of its data limits and the proprietary, crash-prone system behind it. Here are a couple of alternatives. XMPP is a standards-based protocol, built on XML, for bi-directional communication. For chat-style, real-time communication, XMPP – the basis of Jabber and Google Talk – makes much more sense. And there are existing, open source libraries out there with XMPP support, meaning it’s not tough to build upon. It’d be great to use XMPP to allow artists to communicate about what they’re doing in real-time. For collaborating on shared projects, version control is a great way to go. Previously the domain of programmers, version control is catching on with all sorts of people, because it makes collaboration easier by tracking changes. Subversion remains the most popular way of doing this, even as Git gains some traction. And Sourceforge has beefed up its own functionality lately, while Sun’s Project Kenai is developing nicely, too. In other words, I hope this is all the tip of the iceberg. Ideas?